IDentify Your Weeds: Identify the weeds that you need to manage - More than 200 Weed ID resources available on this site arranged by state and region in North America. Many weed listings include information about weed control appropriate for each weed species. EDucate Yourself About Weed Control, Planning and Analysis: Ergonica helps you learn from experts how to prevent and control weed invasion and growth safely, efficiently and effectively for the types of weeds you need to control. Information about integrated cultivation and irrigation methods can help you reduce weed propagation in a natural and safe way. On this site, probably the largest selection (over 40) of weed pullers, poppers and weed defense hand tools on the web, including several popular Weed Twisters! Which Weed Twister Model is Best for You? 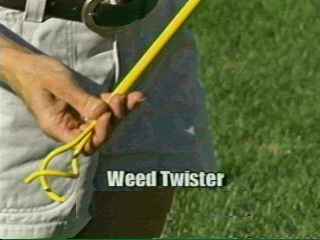 Defend your garden against weeds with the Ergonica WEED TWISTER! The Ergonica World of Weeds 3-D Weed Defense and Control Program is one of the most comprehensive and practical guides for home gardeners available on the Web! Everything you need in one location! Weeds may be simple, non-thinking creatures, but to control their manifestation in your yard effectively and efficiently takes at least a little thought and preparation, and a few tools and products to smooth out the rough edges! Our advice is to Take Your Time: The weeds won't all attack in one siege, nor will they all go away with your first line of defense. Be at ease with the weeds, and keep up you guard, with a smile and a couple of handy tools! Give your herbicide a Boost with the Ergonica Weed Twister Herbicide Helper! Herbicides don't remove weeds, the Weed Twister does: Dead or Alive! Ergonica Seven-Level Ergonomic Balance for Safety also means balancing among completely environmentally safe products and procedures and those that need to be monitored very carefully because of possible harm to gardeners, other workers, children, pets and the total environment of flora and fauna. Balance means using safe products wherever possible before resorting to more risky alternatives. Balance means using safe mechanical tools as much as possible in preference to chemicals of any kind. Balance means using proper cultivation and irrigation methods that reduce the growth of weeds. These methods are described in the Weed Tips page. Much progress has been made in recent years by organic growers who effectively eliminate the need to use dangerous pesticides and herbicides by careful practices. Balance also means selecting plants for your garden that are native to your region or compatible with your native climate in preference to plants that require excessive cultivation and artificial irrigation. Maybe it's time for you to think about Lawn Conversion? Not all weeds are noxious or invasive, and some weeds can fit into your garden with minimal disruption. Reasonable weed tolerance can save you unnecessary work and expense. Likewise, it costs a lot to try to eliminate all bugs and pests, some of which may actually benefit your environment. A careful balance is recommended in the area of bug and pest tolerance, as well. Net result of a careful balance: less work, less expense, less weeds, better and safer environment for you and your family. Shopping for Gifts? See the Gifts Directory.